Toolroom Knights recently announced a brand new summer residency at BOOOM Ibiza for the 2014 season. Running every Monday from 21 July until 22 September, the season will see the brand descend on the Ibiza nightspot with a bang. Led by Grammy-nominated label leader Mark Knight, BOOOM will be treated to a series of diverse line-ups representing the musical range Toolroom is known for. 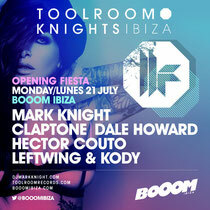 Toolroom arrives this Monday with an opening party line-up featuring Hector Couto, Claptone, Dale Howard and Leftwing & Kody. Over the coming weeks the likes of Basement Jaxx, Tube & Berger, Sebastian Leger, Sonny Fodera, Riva Starr and Mike Mago will join Knight, along with Weiss, Tough Love, Bontan, Prok & Fitch, Rene Amesz and Adrian Hour, who represent the label’s new artist roster. With five successful years on the island already to their name at Space Ibiza, 2014 marks the return to the familiar surroundings of Ibiza Town and Playa den Bossa. The announcement caps an exciting first half of the year for Mark Knight which has seen the British DJ/producer continue to play the global club circuit. With the next instalment of his ‘Bullets EP’ series released, a brand new concept from Toolroom Records set to drop in quarter four and exciting global movements on the horizon ahead, the addition of a residency for BOOOM Ibiza adds to an already big year for Knight and his imprint.